The CRYPTOPOKEMON Lockscreen is a newly discovered threat that has been picked up in an active Internet campaign. No information is available about the hacking group which probably means that they have created the threat by themselves. In other cases the CRYPTOPOKEMON Lockscreen might have been ordered through the dark underground markets. The CRYPTOPOKEMON Lockscreen can be spread using the most common delivery tactics — email phishing messages and crafted malware pages that coerce the users into thinking that they have received a legitimate messages or that they are accessing a safe page. To make them look more convincing the sites can be hosted on similar sounding domain names to well known companies. Stolen multimedia content and lookalike body content can be included as well. Various other techniques can be used as well: the creation of payload carriers that can be both documents or application installers which can be uploaded to file-sharing networks. Another strategy is to embed the necessary code into browser hijackers which are dangerous plugins made compatible with the most popular web browsers. As soon as the infection has happened the virus will launch a series of built-in modules. Depending on the available conditions various components can be executed either in a sequence or when instructed to do so by the operators. A typical virus infection with ransomware will start by modifying key system areas. This includes boot options wherein the engine will be automatically started as soon as the computer boots. Access to the recovery menus and related options might also be disabled which will make most manual user removal guides non-working. This means that effective recovery can be done only with a professional-grade anti-spyware solution. If the sequence includes data deletion it can have a very negative impact on the system by removing the generated backups, shadow volume copies and restore points. This means that in this particular case the victims will also need to employ a data recovery application. Security Bypass — The CRYPTOPOKEMON Lockscreen engine can identify if there are any security programs that can block the normal operation of the lockscreen. When found their engines can be disabled or entirely removed. The list often includes apps such as anti-virus programs, sandbox environments, virtual machine hosts and firewalls. Information Gathering — A data extraction process can reveal sensitive information about the victim users that can expose their identity. At the same time hardware information can be hijacked as well which can be used to create an unique that can be assigned to the machines. Additional Payload Delivery — The made infections can be used to deliver other threats to the compromised systems. Popular choices include Trojans, miners and hijackers. As soon as the built-in sequence has finished running the associated encryption engine will be started. Depending on the actual configuration chosen by the criminals a built-in list of target file type extensions may be used. The affected files can be renamed with the appropriate extension. At the moment the CRYPTOPOKEMON Lockscreen will present a lockscreen which will block the normal running of the computer until the virus is completely removed. User Experience Join Our Forum to Discuss CRYPTOPOKEMON Lockscreen. CRYPTOPOKEMON Lockscreen – What Does It Do? CRYPTOPOKEMON Lockscreen could spread its infection in various ways. A payload dropper which initiates the malicious script for this ransomware is being spread around the Internet. CRYPTOPOKEMON Lockscreen might also distribute its payload file on social media and file-sharing services. Freeware which is found on the Web can be presented as helpful also be hiding the malicious script for the cryptovirus. Read the tips for ransomware prevention from our forum. Update! 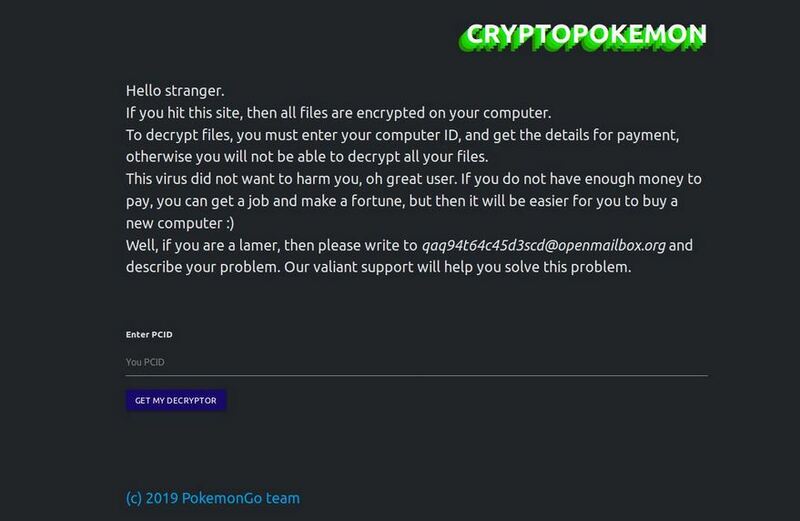 A decryption tool is now available for the CRYPTOPOKEMON ransomware! The tool was created by Emsisoft and can be downloaded from the following link: Decryption Tool. CRYPTOPOKEMON Lockscreen is a cryptovirus that encrypts your files and shows a window with instructions on your computer screen. The extortionists want you to pay a ransom for the alleged restoration of your files. The main engine could make entries in the Windows Registry to achieve persistence, and interfere with processes in Windows. The CRYPTOPOKEMON Lockscreen presents a lockscreen and it will encrypt user data according to a built-in list of target file type extensions. As soon as all modules have finished running in their prescribed order the lockscreen will launch an application frame which will prevent the users from interacting with their computers. It will display the ransomware note to the victims. If your computer system got infected with the .rar Files ransomware virus, you should have a bit of experience in removing malware. You should get rid of this ransomware as quickly as possible before it can have the chance to spread further and infect other computers. You should remove the ransomware and follow the step-by-step instructions guide provided below. Threats such as CRYPTOPOKEMON Lockscreen may be persistent. They tend to re-appear if not fully deleted. A malware removal tool like Combo Cleaner will help you to remove malicious programs, saving you the time and the struggle of tracking down numerous malicious files. Threats such as CRYPTOPOKEMON Lockscreen may be persistent on your system. They tend to re-appear if not fully deleted. A malware removal tool like SpyHunter will help you to remove malicious programs, saving you the time and the struggle of tracking down numerous malicious files. Note! Your computer system may be affected by CRYPTOPOKEMON Lockscreen and other threats. SpyHunter is a powerful malware removal tool designed to help users with in-depth system security analysis, detection and removal of threats such as CRYPTOPOKEMON Lockscreen. 1. Install SpyHunter to scan for CRYPTOPOKEMON Lockscreen and remove them. 2. Scan with SpyHunter, Detect and Remove CRYPTOPOKEMON Lockscreen. Ransomware infections and CRYPTOPOKEMON Lockscreen aim to encrypt your files using an encryption algorithm which may be very difficult to decrypt. This is why we have suggested several alternative methods that may help you go around direct decryption and try to restore your files. Bear in mind that these methods may not be 100% effective but may also help you a little or a lot in different situations. Note! Your computer system may be affected by CRYPTOPOKEMON Lockscreen or other threats. Remove CRYPTOPOKEMON Lockscreen by cleaning your Browser and Registry. Fix registry entries created by CRYPTOPOKEMON Lockscreen on your PC. Combo Cleaner is a powerful malware removal tool designed to help users with in-depth system security analysis, detection and removal of threats such as CRYPTOPOKEMON Lockscreen. Step 5: In the Applications menu, look for any suspicious app or an app with a name, similar or identical to CRYPTOPOKEMON Lockscreen. If you find it, right-click on the app and select “Move to Trash”. Step 6: Select Accounts, after which click on the Login Items preference. Your Mac will then show you a list of items that start automatically when you log in. Look for any suspicious apps identical or similar to CRYPTOPOKEMON Lockscreen. Check the app you want to stop from running automatically and then select on the Minus (“–“) icon to hide it. Remove CRYPTOPOKEMON Lockscreen – related extensions from your Mac’s browsers. A pop-up window will appear asking for confirmation to uninstall the extension. Select ‘Uninstall’ again, and the CRYPTOPOKEMON Lockscreen will be removed. When you are facing problems on your Mac as a result of unwanted scripts and programs such as CRYPTOPOKEMON Lockscreen, the recommended way of eliminating the threat is by using an anti-malware program. Combo Cleaner offers advanced security features along with other modules that will improve your Mac’s security and protect it in the future.